ALL-IN-ONE CHARGING STATION: This desktop charge station with tablet/phone stand provides versatile charging solution for up to six devices. Charge all your devices at the same time and same location to reduce clutter. The outlet strip eliminates the need for proprietary wall chargers and allows ultra fast charging so your devices are always ready-to-go. 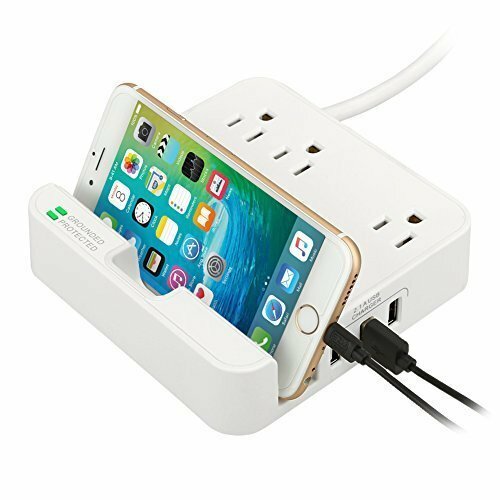 ENDLESS POWER: 3 AC outlets and 3 USB ports offer practical and simultaneous charging capability for multiple devices at home or office. Never again will you need to worry about your smartphone, Powerbank, Bluetooth headphones, portable speakers, tablet PC, laptops, ultrabooks digital camera chargers and more running out of power. SAFETY AND STABILITY: The charging station is FCC, CE, and UL certified which offers multiple levels of protection against overcharging, surges, and overheating. On/Off power switch integrated to provide extra safety. BUILT-IN DEVICE HOLDER: Perfect to hold an iPad, tablet, iPhone or smartphone with access to the device screen and notifications while it charges.